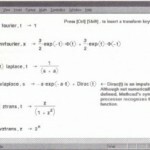 This section describes how to find the symbolic transpose, inverse, and determinant of a matrix. 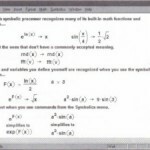 The examples in this section demonstrate ”live” symbolic matrix manipulation using the matrix operators, described , “Vectors and Matrices,” and the symbolic equal sign. You may, however, apply the Matrix commands from the Symbolics menu to matrices on a case by case basis if you prefer. Keep in mind that, unlike matrices evaluated with the symbolic equal sign, matrices modified by commands from the Symbolics menu do not update automatically, as described in the section ”Using the Symbolics menu”. • Place the entire matrix between the two editing lines by clicking [Space] one or more times. • Press [Ctrl] 1 to create the matrix transpose operator. • Press [Ctrl]. (the control key followed by a period). 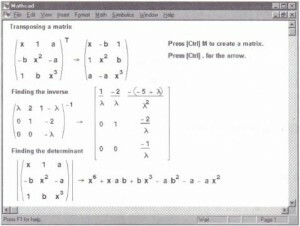 Mathcad displays an arrow, “→” . 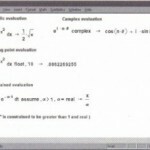 Mathcad returns the matrix with its rows and columns swapped to the right of the “→”. Another way to find the transpose of a matrix is to select the matrix and choose Matrix⇒Transpose from the Symbolics menu. • Press [Ctrl]. (the control key followed by a period). Mathcad displays an arrow, “⇒” . • Press ∧ – 1 to indicate matrix inversion. 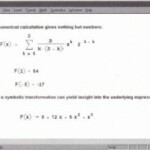 Mathcad will return a symbolic representation for the inverse of the selected matrix to the right of the “→”. Another way to find the inverse of a matrix is to select the matrix and choose Matrtx⇒Invert from the Symbolics menu. 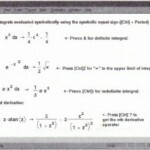 • Press I to create the matrix determinant operator. 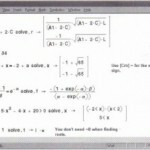 Mathcad will return a symbolic representation for the determinant of the selected matrix to the right of the “→”. Keep in mind that this is usually a lengthy expression. Another way to find the determinant of a matrix is to select the matrix and choose Matrix⇒ Determlnant from the Symbolics menu.